W Aquilae (W Aql / SAO 143184 / GC 2525) is a variable star in the constellation of Aquila. Its distance from the solar system is estimated between 1,100 and 7,502 light-years. 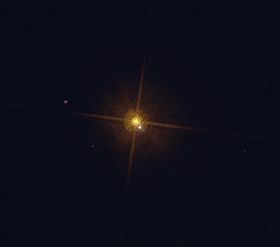 W Aquilae is an S-type star with a spectral type of S39e to S69e, a red giant similar to M-type stars, but in which the dominant spectrum oxides are formed by metals of the fifth period of the periodic table. W Aquilae is also rich in the element technetium. Another feature of this class of stars is the stellar mass loss, in the case of W Aquilae is estimated at ~ 6993400000000000000♠4×10−7 solar masses per year. Its effective temperature varies between 2,250 and 3,175 K and its diameter between 430 and 473 solar radii. It is also a very luminous star, between 9,740 and 28,885 times more than the sun. W Aquilae is a variable whose brightness oscillates between magnitude +7.3 and +14.3 over a period of 490.43 days. In Mira variables (which are named after Mira, the prototype), this instability comes from pulsation in the stellar surface, causing changes in color and brightness. W Aquilae, a Mira variable, shows silicon monoxide maser emission. A magnitude 14.8 companion has been detected 0.47" SW of W Aquilae. This is fainter than W Aquilae at minimum and corresponds to an absolute magnitude of +7.1. Although that absolute magnitude would correspond to a K4 main sequence star, a spectrum was classified as F5 or F8. The separation between the two stars is 160 AU. A 2014 study of W Aquilae and α Centauri with the ALMA array claimed to have accidentally detected a previously-unknown solar system object. This received widespread press coverage as a potential discovery of planet X. The paper was withdrawn without being accepted for peer-reviewed publication. ^ a b c Høg, E.; Fabricius, C.; Makarov, V. V.; Urban, S.; Corbin, T.; Wycoff, G.; Bastian, U.; Schwekendiek, P.; Wicenec, A. (2000). "The Tycho-2 catalogue of the 2.5 million brightest stars". Astronomy and Astrophysics. 355: L27. Bibcode:2000A&A...355L..27H. doi:10.1888/0333750888/2862. ISBN 0333750888. ^ a b c Samus, N. N.; Durlevich, O. V.; et al. (2009). "VizieR Online Data Catalog: General Catalogue of Variable Stars (Samus+ 2007-2013)". VizieR On-line Data Catalog: B/gcvs. Originally published in: 2009yCat....102025S. 1. Bibcode:2009yCat....102025S. ^ a b c d e Mayer, A.; Jorissen, A.; Kerschbaum, F.; Ottensamer, R.; Nowotny, W.; Cox, N. L. J.; Aringer, B.; Blommaert, J. A. D. L.; Decin, L.; Van Eck, S.; Gail, H.-P.; Groenewegen, M. A. T.; Kornfeld, K.; Mecina, M.; Posch, Thomas; Vandenbussche, B.; Waelkens, C. (2013). "Large-scale environments of binary AGB stars probed by Herschel. I. Morphology statistics and case studies of R Aquarii and W Aquilae". Astronomy & Astrophysics. 549: A69. arXiv:1211.3595. Bibcode:2013A&A...549A..69M. doi:10.1051/0004-6361/201219259. ^ a b c d e f Danilovich, T.; Olofsson, G.; Black, J. H.; Justtanont, K.; Olofsson, H. (2015). "Classifying the secondary component of the binary star W Aquilae". Astronomy & Astrophysics. 574: A23. arXiv:1501.00863. Bibcode:2015A&A...574A..23D. doi:10.1051/0004-6361/201423672. ^ a b Tevousjan, S.; Abdeli, K.-S.; Weiner, J.; Hale, D. D. S.; Townes, C. H. (2004). "Mid-Infrared Interferometry on Dust Shells around Four Late-Type Stars". The Astrophysical Journal. 611: 466. Bibcode:2004ApJ...611..466T. doi:10.1086/421990. ^ a b Ramstedt, S.; Schöier, F. L.; Olofsson, H. (2009). "Circumstellar molecular line emission from S-type AGB stars: mass-loss rates and SiO abundances". Astronomy and Astrophysics. 499 (2): 515. arXiv:0903.1672. Bibcode:2009A&A...499..515R. doi:10.1051/0004-6361/200911730. 515-527. ^ Vlemmings, W.; Ramstedt, S.; Maercker, M.; Davidsson, B. (2015). "The serendipitous discovery of a possible new solar system object with ALMA". 1512: arXiv:1512.02650. arXiv:1512.02650. Bibcode:2015arXiv151202650V. This page was last edited on 3 November 2018, at 18:35 (UTC).